I hate painting, as I know many people do. One of my issues has always been the streaks that are left on the wall. I got to thinking that perhaps I'm applying too much pressure when I'm painting, and that's what is causing the streaks to show (even after a 2nd or 3rd coat). So, how are SUPPOSED to paint? Are you supposed to load the roller up with a bunch of paint and only apply light pressure? Or do you just want to saturate (but not dripping) the roller and push a bit when rolling? I know it's a simple question but I'm really bad at painting, that's all I can say. The problem is probably not pressure (assuming that you remain consistent), but what I call "stretch". Folks tend to stretch the paint load of their roller or brush too far. With experience you'll learn what's the appropriate coverage area for a loaded roller. Load the roller with paint. My technique is to pull some paint from the pool up the slope of the pan, and then work the roller into it a few times so that I have even coverage all the way around the nap. Make contact with the wall 6-12 inches away from the newly-painted region. This drops the initial load of fresh paint on dry land, so to speak, and creates a temporary repository of paint. Work back to the previously painted zone, overlapping somewhat. Roll direction isn't important at this point. Work remaining excess paint from the repository outward, stopping when it becomes difficult to get coverage. This is the extent of coverage for that roller payload. Do not increase pressure to gain more coverage. Give the newly painted area one more roll, all in the same direction, blending with the previous area. Keep an eye out for voids and runs, which should be rare. At this point the roller should be fairly dry and not leaving edge lines. If it is, roll the edges out on new wall to clean them up, then re-roll the working area. Using this technique I get consistently good results. For most interior wall situations, a coverage zone for a loaded roller is about 2ft. by 3ft. Maybe less. I also paint almost exclusively with quality 3/8" nap rollers. I don't mind a bit of stipple, which helps hide roller lines and wall imperfections. Or you have other problems. All this said, if you're seeing streaks after a third coat, something else may be going on. Maybe you're rolling too long after the film starts drying. Maybe your roller has residual primer or paint of another color in it. Maybe the paint needs better mixing. When I paint with a roller, I only do a small squarish area at a time, no larger than 3 feet square. I load up the roller, then roll it across the area in a zigzag pattern, then (without reloading the roller) repeat the process at a 90 degree angle to the first pattern, blending the paint into the previously painted area. Then I load up the roller again before proceeding to the next unpainted "square." This method helps to ensure uniform coverage. Some paint pigments are semitransparent -- reds are especially so. When used with a deep base (instead of a pastel base), it can take many coats to get even coverage. Sometimes it helps to use a tinted primer before the first coat of paint. That looks like you are not applying the paint thick enough, either you are applying coats too thin, or you are applying too few of them. Buying a quality paint is well and good. But bold colors like that require a deep base, which is almost transparent. In those, the pigments do all the heavy lifting. The pigments come from a carousel, and you notice the paint shop only has one or two such carousels. That means they are using the same pigments on the cheap and good paint alike, so the cost of the cheap paint can cover the pigments. This looks like a building interior, and almost always, they are painted with pastel (off-white) paints. So essentially you are covering white with a bold color. A big change like that asks a lot of the pigments. You can't possibly get it done with one coat, and may need 3 or even 4. What's more, it's natural for coverage to be imperefect, and that'll really show on one coat. With 2-3 it will average out. Really interesting to read all the different techniques folks use! Most of my ceiling heights are 2.4m or 8 foot and I find a loaded roller will hold enough paint to cover one "floor to ceiling" strip. Hit the wall in the middle and then roll the paint up and down several times (keeping broadly within the rollers width). Load up the roller and repeat. NEVER stop in the middle of the wall. Keeping a wet leading edge is vital which is why I don't go in squares as you'll always have one dry edge. Going top to bottom in one go means I'll always have a full height 'wet' leading edge. Also as already mentioned, a longer pile is easier work. I'm painting daily right now and up to Christmas and usually use a middle length pile which is perfect for the flat drywall I'm working on. ALWAYS use a roller pole, it counterbalances the weight of the loaded roller head (and saves your back!). It also allows easy application of the right amount of pressure. Holding the roller directly means it's very difficult to apply the same pressure as you bob up and down. I use an aluminium extendable one on it's shortest length, around 70cm or so. Pressure, hmm. Yes you do need to apply an even pressure but it's not very much. Too little and you won't move the paint up and down the wall, but too much and you'll get lines at the edges of the roller. 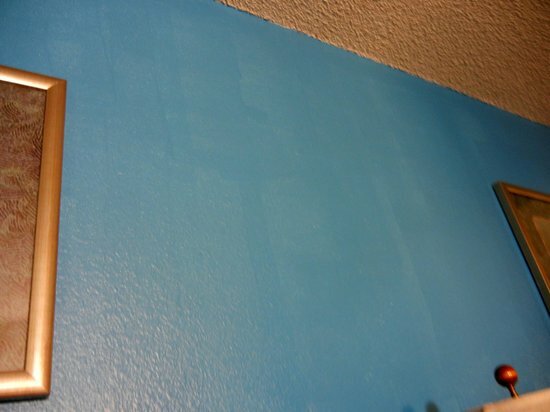 Oh, and good paints usually don't need more than two coats (unless you're going for a huge colour change/difference). Wanted to up-vote Handymans post. Read it, do it. That's exactly how to professionally roll out a wall. the only thing I Might add to that is - never paint out of a flat pan / tray - you spend all your time fighting it, moving / spilling it, and refilling it mid wall / ceiling. Always roll out of a 5 gallon bucket with a "grid" that is made for that. It is cheaper than a tray anyway. Put as much as you need, up to about 2 gallons, of paint in the bottom of the clean empty 5 gallon bucket. Now you have enough paint to get something done without stopping to refill. The grid also allows excess paint to be released from the roller. What's wrong with my painting technique? What should I do before re-painting my skirting boards? How can I get floor paint to stick better on our outside stairs? Is it ok to wait several days (after undercoating) before applying an oil-based top coat?